Next stop: France. 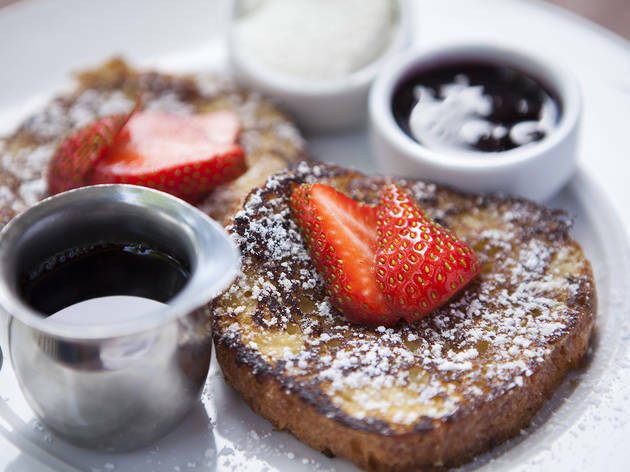 Want to start your morning like the French? The best brunch in LA for croque-madame, croissants and more is as close as the Westside—bien sur! While traditional French fare may be hard to come by in a city that’s seen the shuttering of the greats—L’Orangier, Citrus, Bastide—Alain Giraud still serves dishes you’re more likely to find by the Seine than in sleepy Pacific Palisades. Following the close of his Santa Monica brasserie Anisette, Giraud’s more casual set-up offers a cafe-like sidewalk patio and the city’s most buttery croissants from the bakery. Brunch-goers order Croque-Monsieur ($14) made with ham, creamy béchamel and just enough Gruyere cheese—gooey in the center and crispy, burnt crust on the outside. Top yours with an egg for a Croque-Madame ($14) and go for fries on the side—mixed green salad or fresh fruit if you must, but the crispy taters reminds us of McDonald’s minus the salt bomb. Bonus: the old school touch of the doily on the plate. And what would a French breakfast be without bread? There’s freshly baked baguette—from one of L.A.’s best bakers Noubar Yessayan who serves his with butter and homemade seasonal preserves—and brioche French toast ($10). 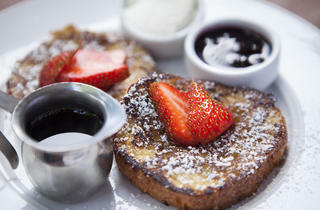 Breakfast served Mon-Thu 7:30-11am, Fri 7:30-11am; Brunch served Sat 7:30am-2:30pm, Sun 8am-2:30pm. 1032 Swarthmore Ave, Pacific Palisades; 310-459-7561; www.maison-giraud.com.